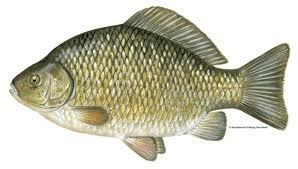 The crucian carp is a lovely, enigmatic fish but, by the same token, one of Britain's most frustrating. Catch a big crucian carp and you will be amazed by its fantastic gold colouration, but catching a crucian carp of any size can be a real challenge in itself as they are the most delicate of feeders. Crucian carp don't grow anywhere near as large as common carp and a 2lb crucian carp is a very worthy fish to have caught. The current British record stands at a very impressive 4lb 9oz 9dr, caught by Martin Bowler.